Quality engineered for easy welding of duplex stainless steels. Superb weld integrity - resists corrosion and cracks. Highly economical - one alloy does job of several. SPECIAL FEATURESMagna 395 Special Alloy for Duplex Stainless Steels tackles the "Difficult" welds. Magna 395 Special Alloy for Duplex Stainless Steels tackles the "Difficult" welds. Magna 395 is quality engineered specially for the easy-welding of duplex stainless steels. Magna 395 gives outstanding weld integrity, resisting corrosion and cracking. Magna 395 is highly economical - one alloy does the job of several normally stocked by maintenance men. 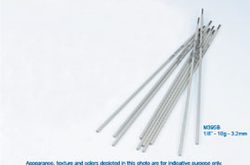 Gives tensile strength to 110,000 p.s.i (75 kg/mm2) - yield strength to 80,000 p.s.i. (55 kg/mm2). Repairs several different types of duplex stainless steels quickly. Provides deposits that resist pitting and are virtually immune to intergranular corrosion. Offers good resistance to saltwater corrosion. Magna 395 (for AC & DC) enables you to take on even the toughest jobs with confidence.